I am having connection problems. What is the recommended configuration when shooting tethered to a laptop computer? Force battery mode or use powered firewire hub. Below are suggested configurations when shooting to a portable computer such as a PC or Apple laptop and iMac's. This solution should be used for some specific desktop Apple computers such as iMac or Mac Mini. These computers do not provide enough power through their firewire ports to completely support the digital back in tethered mode. A powered firewire repeater is required. Please see below for recommendations. This forces the back to use battery power. You can also use a powered firewire repeater. Set the unit to "force battery mode". This refers to a situation when the back will be forced to use battery as its primary source of power even though it is connected to a computer via firewire cable. To activate this mode, please access "Menu" on the digital back and select > "Configuration" > "Power Source" > "Battery" > Choose "Green Check". These backs require and will only draw power from the battery so no additional hubs are required. If connecting directly to a portable computer battery charging should be set to Off in Power Management. If you want to charge the battery as well, connet via a powered firewire repeater. Aptus backs cannot use battery while tethering so all power must come form the firewire cable. To provide enough power to run the back you must connect via a powered repeater. What Firewire Repeaters are recommended? 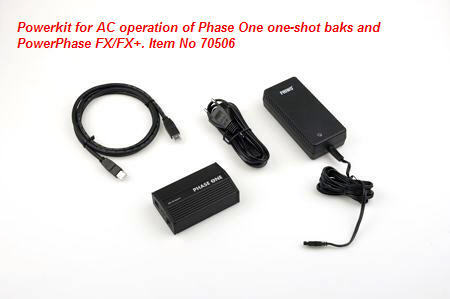 What is the Power kit for PowerPhase FX (Item No. 70506)? Repeater & AC adapter. Can be used as a substitute for the battery in the portable solution. If you want to use the portable solution with an AC power supply please order the power kit. Please Contact your Phase One Dealer to order these components.